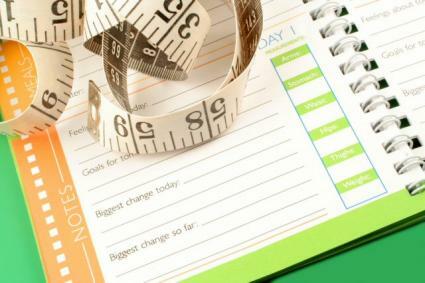 Tracking what, when, where, and why you eat in a food diary can be the master key for unlocking the weight loss secret. You will be able to see a clear picture of eating habits that may otherwise go unnoticed, yet be the main culprit for those unwanted pounds. measured amounts of foods consumed such as one cup, one tablespoon, etc. By keeping a running list of food, calories can be assessed and modified as needed. Also, by writing down when and where you eat, you may be able to save yourself the extra calories by avoiding that particular environment in the future if it caused you to eat for reasons other than hunger. A food diary will also show you whether or not you are getting the recommended number of servings for fruits, vegetables, dairy, whole grains, and protein over the course of day. For more information on this subject, please read our article related to the Food Pyramid. In addition, by reviewing a particular meal, such as breakfast with a higher than usual fat content from the eggs and bacon, you can choose a lower fat lunch to balance out the day's worth of food. For example, a lunch of salad with lean protein from grilled chicken and a low-fat dressing will fit in quite well with that high fat breakfast. Similarly, by assessing fluid intake, you can ensure that you are getting the recommended eight glasses of water a day. Finally, mindless eating and drinking is finally put to a halt. There are no more "hidden" calories being allowed to creep in. By documenting every morsel of food and drop of fluid that enters your body, you will be able to account for each calorie and make appropriate changes. For example, the soda you drank on your way home from errands will no longer go unnoticed and now may become the source of your weight plateau of which you can easily eliminate by drinking a bottle of water or calorie-free drink instead. Studies show that keeping a food diary helps a person discover eating habits that may be contributing to weight gain or plateaus in weight loss. Many weight loss programs, such as Weight Watchers and The Best Life Diet encourage the use of a food log of some kind due to its proven results with successful weight loss. In fact, most weight loss plans offer their own version of a food journal to use while following their program. Not only can empty calorie foods be eliminated, but portions can be decreased by gradually eating one less forkful or cupful of any given food entry. Keep your food diary visible at all times. For example, if you eat most of your meals at your kitchen table, then keep your log there. Keep a pen or pencil with your food journal at all times. Think off the paper. For example, if you use your computer most of the day, then use a spreadsheet program to develop a functional journal for you. Measure your food during the first few days of keeping your journal. Have a nutritionist assess your logs if you hit a plateau in your weight loss. After you reach your weight loss goal, keep a log periodically to keep healthy habits in check.